Back on July 30th, I got to witness a once in a lifetime occurrence for my client Steve Ruiz. We were fishing the Middle Provo River in Utah where I spend a lot of time. The river has kicked out a lot of bigger fish the last couple of years as it has had some time to adjust to the full scale restoration project that was finished back in 2008. It's a stretch of river where I once was happy to see a fish each day around 16". Now I've come to expect several in the 18-22" range a day when the river is fishing well. The day with Steve started hot for big fish. His first fish that made it to the net was around 21" and was a cracking way to start. My comment to him at the time was, "enjoy that fish as it's going to be hard to top." I didn't know how wrong I was. 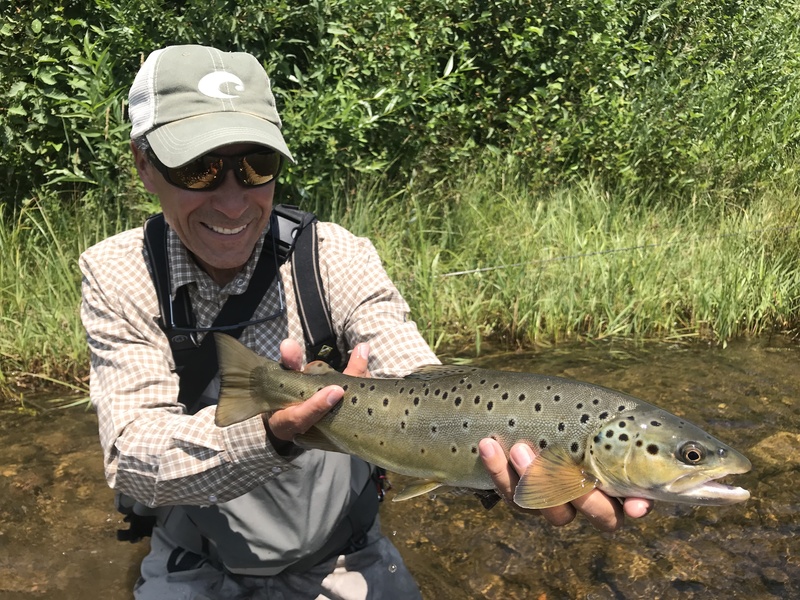 The morning continued to fish well with good numbers of mid-sized fish and several more 18-20" brown trout that showed their mid-summer form by running and jumping emphatically. Steve began to get the handle on the rod angles, leverage, and directional pressure that land fish quickly and reliably. This proved to be critical later. After lunch, the fishing picked up even a bit more as the mid-day PMD hatch started to gain momentum. 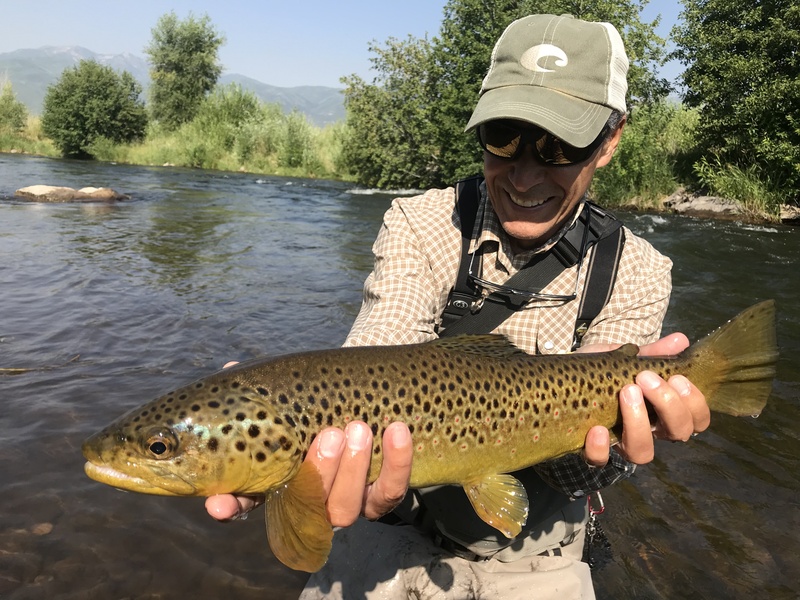 Despite the steady success we enjoyed during the morning, each spot required a mix of dead drifts and animated drifts combined with regular fly changes to maximize the number of fish caught. At about 1:45, we reached a corner bend in the river where a stack of rocks creates an eddy on the far bank. This kind of eddy is a common occurrence on this river where habitat structures were placed during the restoration project. Steve thoroughly fished the eddy from back to front and covered the near side seam as well as the recirculation on the far side. Surprisingly, he only caught one small fish from the lower 1/3 of the eddy. His drifts were good enough that I thought he should have caught more fish. I now know there was a reason other fish didn't show themselves....they'd been kicked out. As we reached the head of the eddy, just behind the boulders at the top, I was about to switch flies or have Steve move on to the next holding lie. At the previous location we had fished, I switched to a size #12 Blowtorch with a large 3.8 mm bead to attain depth in the deep turbulent water. I began to question whether the change was a good one after the lack of success in the eddy. However, the rootbeer krystal flash bodied perdigon (butano variation) on the dropper had been successful throughout the morning so I expected that it would have worked in the eddy even if the blowtorch didn't. Something in the back of my mind told me to have Steve make a couple of drifts with some subtle 3-4" jigging motions to animate the nymphs before we moved or changed flies. 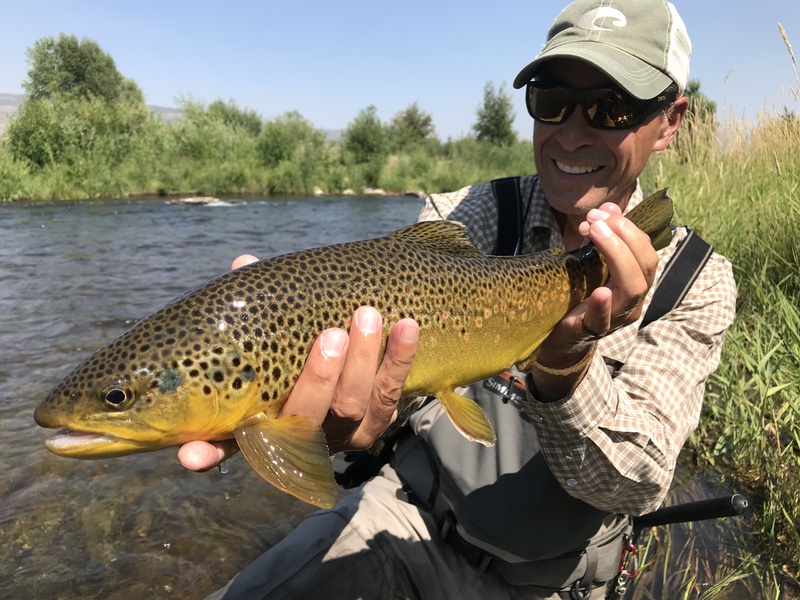 After drifting through the exact same spot for 10-15 drifts with a dead drift, Steve lifted his flies a few inches and dropped the rod tip back to the previous elevation to continue the drift. On the drop the sighter hesitated slightly and I said "set!" The tell tale sign of a fish making large headshakes began. I knew the fish was pretty big but neither of us realized just how big. I assumed it was another fish in the 20" range. 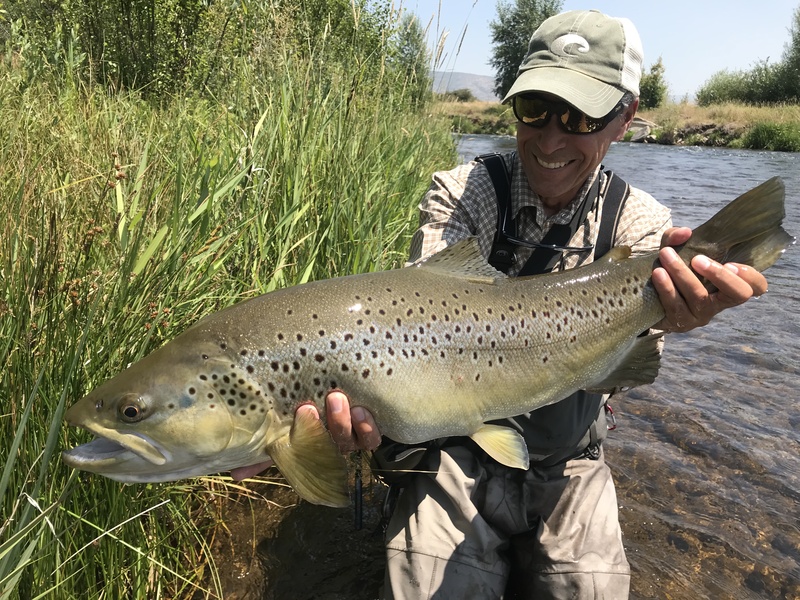 However, though Steve used full upstream side pressure with a deep c-shaped flex in the rod, this fish regularly returned to the safety of the fast broken water on the far bank where we couldn't see it. The yo-yo tug of war continued for several minutes before the fish took a long screaming run downstream. Luckily there was some flat fairly featureless water there where we had some room to follow it before the fish could get into the rapid below. Steve dutifully followed the fish keeping proper angles. When I got my first good glance at the fish, I realized it was big....REALLY BIG! I thought the fish was around 24-25" when seeing it in the middle of the river. I coached Steve to continue the same program putting as much pressure as possible on the fish without breaking the tippet. 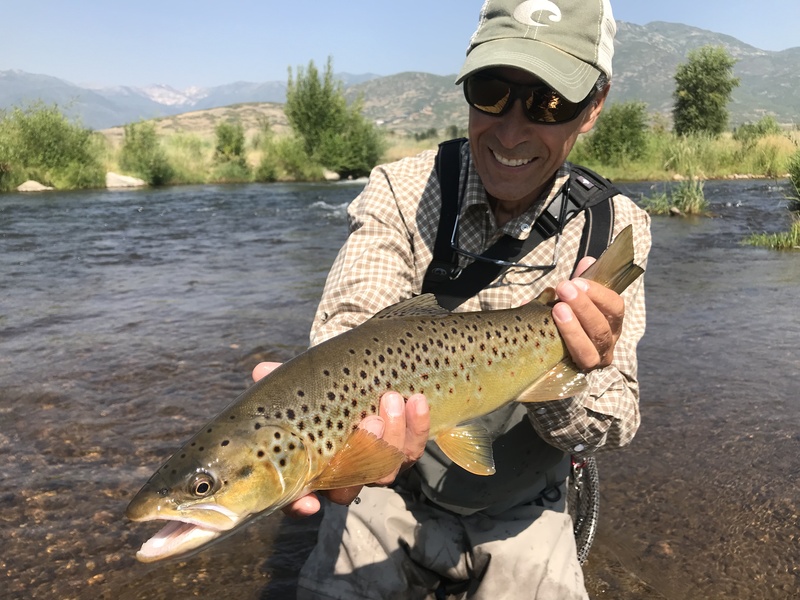 However, with only 6x Cortland tippet and Steve's 10' 6" Cortland nymph rod, there was only so much leverage he had to work with. Each time the fish came closer and I prepared to net it, it would take off on a heart stopping run to the far bank with me fearing the worst. But Steve patiently kept clawing it back into netting position again. On about the fifth time this happened, the brown trout nearly wrapped around a stick and I ran up to it to either spook it away from the stick or make a desperate attempt to net it. Thankfully it ran off and Steve repeated the process of reeling it back into position. At this point, I knew I needed to do something to change the paradigm as I didn't want to wear the fish out any further and also knew that the longer the fight lasted, the greater the chance of the knot giving or the hook pulling out. Furthermore, one or two more runs and we were going to be out of space before the fish went down the rapid of no return. As Steve worked the fish into position again, I took a position in the middle of the river to block it's escape to deep water. I knew that the fish would either make one final bolt ending in failure and me wearing the dunce cap, or the position would force the fish to slower water near the bank where we had a chance at getting the net under it. As I made the move, the fish saw me in its peripheral vision. It flinched for just a moment and it's head tilted upward and toward Steve. I yelled at him to lift up and lunged with extended arms. Just like that, the beast was in the net. Steve and I were beyond speechless. We literally did not know what to say. It was beyond expression. We took a moment to admire the fish while it relaxed and recovered in my net. I removed the Blowtorch from its premaxillary where thankfully it was firmly embedded. Steve posed quickly with the brown for a couple of photos. Before we released it, I cradled it in the water while Steve taped its length at 27" and it's girth at 16". 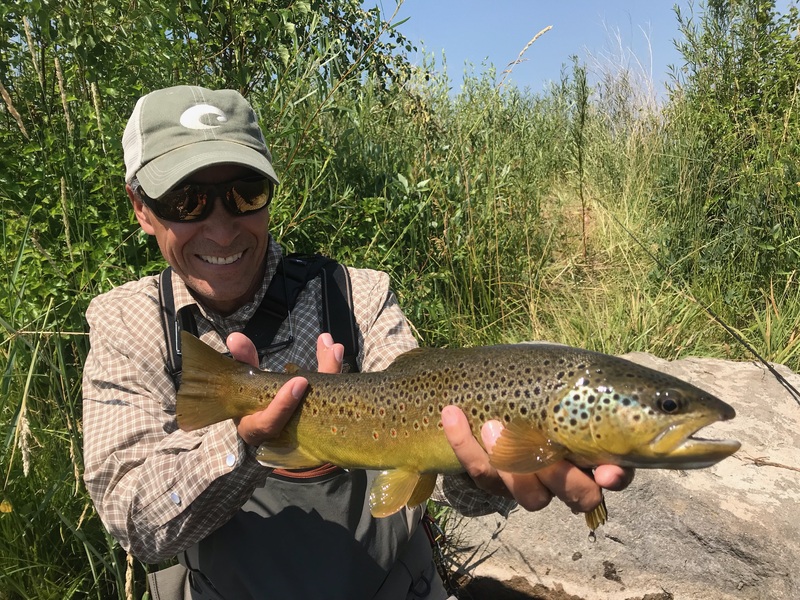 After 21 years of fishing the Provo River, it was the largest fish I've seen from the river. It's likely I won't see another one bigger in the next 21 years. For Steve, it was certainly a fish worthy of the title "fish of a lifetime".